Our programs for Lent and Holy Week commence with an extraordinary discovery and world premiere recording of a previously-unknown masterpiece by Pergolesi. The history of the oratorio Septem verba a Christo in cruce moriente prolata is as shrouded in mystery as its probable creator. The title of the work and the assertion of Pergolesi's authorship have haunted musicological circles for a century or so, initially on the sole basis of an incomplete manuscript catalogued in the Bayerische Staatsbibliothek since 1882 and regarded there as genuine. The recent discovery of two more manuscripts in the abbeys of Kremsmu¨nster and Aldersbach by musicologist Reinhard Fehling settled the issue of authenticity once and for all and Pergolesi's lost masterpiece was given its concert première at the Beaune Festival in July 2012 and recorded shortly after by the Akademie für Alte Musik Berlin led by René Jacobs. Featured soloists include soprano Sophie Karthaüser, counter-tenor Christophe Dumaux, tenor Julian Behr and bass-baritone Konstantin Wolff. 2. Verbum II: Amen dico tibi ("Verily I say unto thee, today shalt thou be with me in paradise"). When two 18th century manuscripts of the Seven Words of Christ came to light in 1930, attributed by copyists to “Sig. Pergolese”, a debate was sparked as to their authenticity. 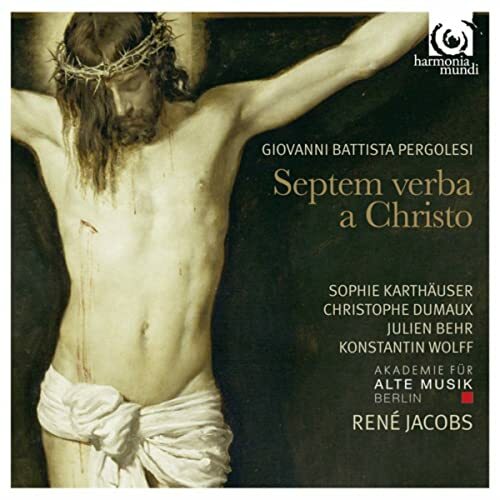 Was it indeed a work by Giovanni Battista Pergolesi, composer of the Stabat Mater? Or, had it simply been misattributed? No one could say for sure. The conductor Hermann Scherchen tried to shift the attention back to the quality of the work itself, calling it “one of the most heartfelt works of art, full of profound tenderness and an all-conquering sense of beauty”. However, unattributed 18th-century works don't tend to rack up a great deal of performances, regardless of their profundity, and this one was no exception. Further sets of manuscript parts were found over the years. But still it wasn't until 2009, when musicologist Reinhard Fehling discovered a set of performance manuscripts, that the music could finally be traced back to Pergolesi without an actual autograph score. Subsequently, the work was given its concert premiere at the Beaune Festival in July 2012, and this world-first recording was made a few days later. Listening to the work, it's hard to see what the authenticity hoo-hah was about. Certainly it's very different to Pergolesi's sublime Stabat Mater. But there are plenty of his stylistic thumbprints. This “heartfelt work of art” is indeed as wonderful as Scherchen described. Scored for four solo vocalists, trumpet, two horns, harp, strings and basso continuo, the Seven Words of Christ is a cycle of seven cantatas, each consisting of two arias. Recitatives are kept to a minimum. Essentially a dialogue between Christ on the cross and the “Anima” (Faithful Soul), the tone is reverent, devotional, with some striking instrumental symbolism injecting some unusual colouring. A solo horn denotes Christ's kingliness, muted trumpet symbolises his veiled divinity as he suffers on the cross, and a focus on the timbre of violas over violins adds further melancholy. Most of all, though, the work is beautiful, and its deeply spiritual loveliness has been realised in a fine period performance. Certainly, it won't be languishing in dusty libraries any more. It is, in its own way, just as sublime as the Stabat Mater, and René Jacobs and his musicians have given it a comprehensive rehabilitation.